Rupert Murdoch’s eldest son Lachlan will be chairman and chief executive of the successor to 21st Century Fox after it sells its entertainment assets to Disney, the US firm has said. The 46-year-old is co-executive chairman of Fox with his father. John Nallen, Fox’s chief financial officer, will become chief operating officer of the new company. 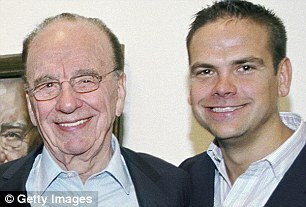 The Murdoch family trust owns 17 per cent of Fox but has about 39 per cent of voting rights through special shares. Fox is trying to buy the 61 per cent of British broadcaster Sky it does not own for £11.7billion, while steering its £39billion deal with Disney to completion. But plans are being hampered by American cable giant Comcast, which has put in a higher bid for Sky and is plotting to outbid Disney for Fox’s entertainment assets.